My column this week on msnbc.com – Free meals on planes fly into the sunset – is all about the demise of “free” meals for economy class passengers on domestic airlines. It’s also about the efforts airlines are making to convince travelers to buy their meals on board. Working on the story was especially fun, because there’s not only a reader survey accompanying the story, but a slide show of airline snacks and meals and a photo gallery of airplane meals sent in by readers. She was right about the complimentary meals. Today Continental Airlines, which recently merged with United, begins selling buy-on-board meals on all domestic flights less than six hours. Hawaiian Airlines continues to offer its passengers complimentary meals, plus a premium option for purchase (bestsellers: sushi and cheeseburgers), but Continental is the last major domestic airline to jettison free meals. Continental’s chief marketing officer, Jim Compton, terms the move away from free-food a reflection of “today’s market and customer preference.” But cutting out complimentary meals will save Continental an estimated $35 million a year. Not that much dough when an airline’s success is measured in billions of dollars, but still significant in an era when every penny counts. For now, most airlines continue to offer complimentary coffee, tea, water and soft drinks. Some continue to serve snacks. Continental’s Mary Clark says “Our complimentary snacks are still offered with beverage cart service on most flights; cookies in the morning and pretzels for the rest of the day/evening.” Southwest Airlines passengers can snack on peanuts or pretzels on all flights. Complimentary snacks on AirTran and United include small bags of pretzels or Biscoff cookies. Delta Airlines adds peanuts into that mix. Midwest Airlines became famous for its complimentary, warm chocolate chip cookies and, now that the airline has merged with Frontier, the cookie tradition continues. 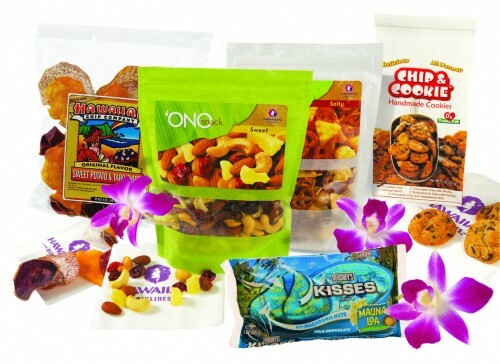 Alaska Airlines hands outs a complimentary snack mix and, on some longer flights, Cougar Mountain cookies. Alaska passengers going to Hawaii are also treated to a small serving of Mauna Loa Macadamia nuts and a complimentary Mai Tai or passion orange guava juice. JetBlue offers passengers unlimited servings of chips, cashews, animal crackers and other items. And each month regional Horizon Air offers passengers a different Northwest wine and microbrew at no extra charge. During October, to celebrate its 3rd year of flying to Hawaii, Alaska Airlines is selling Hawaiian-themed meals, such as the Hawaiian Breakfast Skillet, on all flights 2.5 hours or longer. Alaska’s Marianne Lindsay says the airline’s food and beverage team works year-round with a design chef from LSG Sky Chef, one of three major in-flight catering companies, to create meals that feature many regional food items. “We also post the chef’s email address in our inflight magazine,” she said. Spirit Airlines lists its food for purchase in its on-board magazine, not online as most other airlines do. The airline sells soft drinks ($3), animal crackers, instant soup and other snack items ($2-$4) and offers mix-and-match value meals for $3 to $14 dollars. For example, a single beer or wine is $6, but if you buy three drinks at once, the package price is $14. As they did with baggage fees and fees for extra legroom, aisle seats and other unbundled airline amenities, passengers are getting used to the idea of buying their own in-flight meals. But that doesn’t mean they’re buying those meals on airplanes. In Zagat’s 2009 airlines survey, 19% of travelers said they’d willingly pay for snacks on domestic flights. Only 6 percent of those surveyed said if a free meal isn’t offered they typically purchase buy-on-board meals. Are travelers filling up on Pringles or going hungry instead? 7% said they were, but 56% of those Zagat surveyed said they bought their in-flight meals at the airport. What else will travelers love? United Airlines is hoping passengers will love ordering, and paying for, their in-flight meals before they even get on the plane. Last week the airline introduced two $24.99 brunch options, with chocolate and sparkling wine, for customers flying transcontinental p.s. (premium service) flights between New York’s Kennedy airport and Los Angeles or San Francisco. The twist: meals must be ordered on-line, 72 hours before a flight. While I liked the freebies, I didn’t like the extra calories or other unnatural ingredients that I knew weren’t good for me. It’s much better to bring my own stuff. Hopefully they won’t start charging a fee for that – like some restaurants do if you bring your own wine. But the prices they charge for the in-flight edibles (if you can call them that) are ridiculous if you’re buying for a family with small children. And even in the airport, it’s hard to find healthy options for kids. So we end up bringing a passel of snacks from home, but I’ve heard that some security checkpoints won’t allow over a certain amount of food for kids/babies on board.